I’ve only just realised that I’ve had a bit Swedish weekend. Friends from the south and the north descended on friends in the middle for our first Eurovision party. 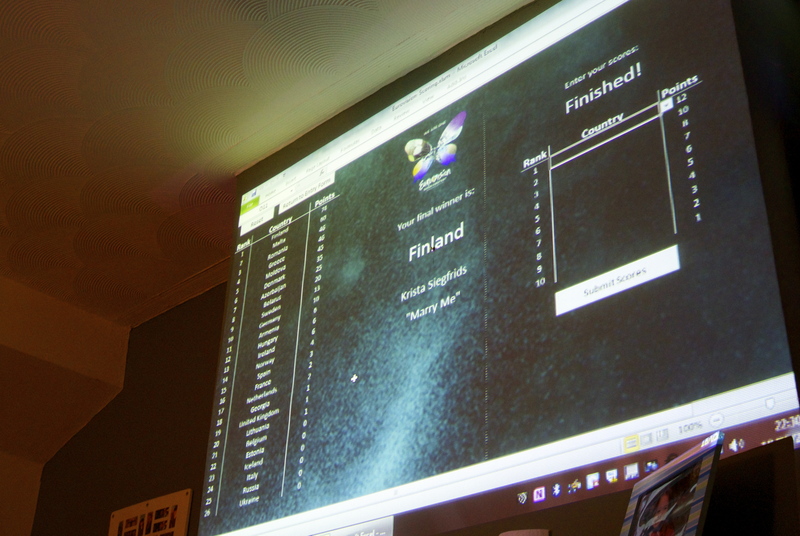 But this was no ordinary party – we had a spreadsheet projected on the wall. It was a pretty damn amazing and I almost fainted at the beauty (visit Mild Concern for all your data needs. Seriously). After the songs had been heard, notes had been made and data had been entered, our winner was decided – Krista Siegfrids from Finland with Marry Me. I loved it for the Vegas theming and the song was so damned catchy. Whether there was a political message behind it or not, it deserved to win and I genuinely can’t believe she came third from last – SCANDAL! A very close second for me was Gianluca Bezzina from Malta with Tomorrow. It was adorable, and I loved the kinetic typography projected behind him. I’m trying to remember where I placed the actual winner in my voting – Emmelie de Forest from Denmark with Only Teardrops. I think I had her third. It was very catchy and it will mean that Copenhagen will be even more expensive to visit next year (I still love it though). I loved the (inadvertent?) symbolism of Emmelie walking across the Øresund Bridge – taking Eurovision from Sweden to Denmark. Cute! However, this all paled into comparison when we saw Petra Mede performing the Swedish Smörgåsbord. THIS SHOULD HAVE WON! Man, it’s making me want to visit Sweden. And to complete my Swedish weekend, Tim and I took an impromptu trip to Ikea on the way home from Middle England where I spent £50 on stuff I don’t need and hadn’t really considered too much before today. And some seeds, which we’re both going to grow separately and try not to kill.